Hello again...been lurking here for more than a year now, mainly watching the Saladin related threads for useful information. 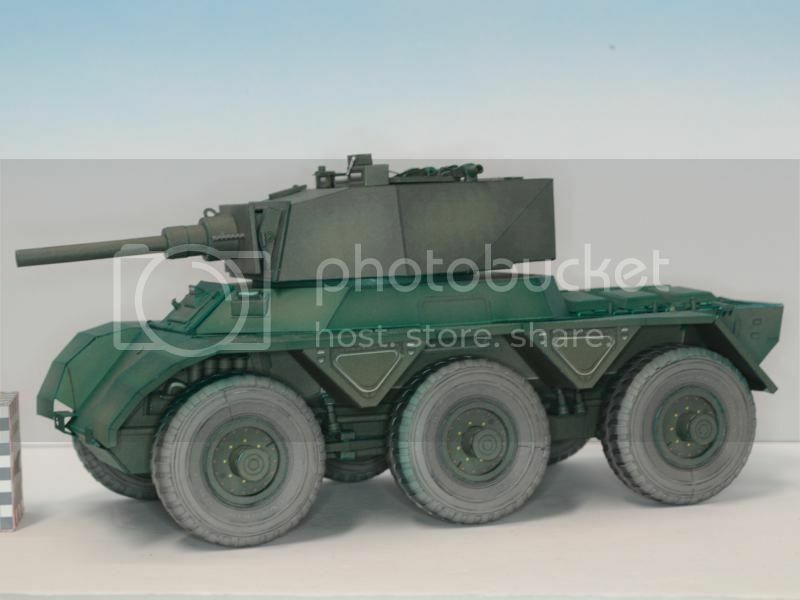 and I have been working on a 1/16 scale Saladin kit. I've been lucky enough to find this place, and a number of other photo sources. that have helped me with my work. The design has come a long way in the past year, and I thought maybe it was time to share the progress here. Anyway, I'll just post a few facts and some photos. 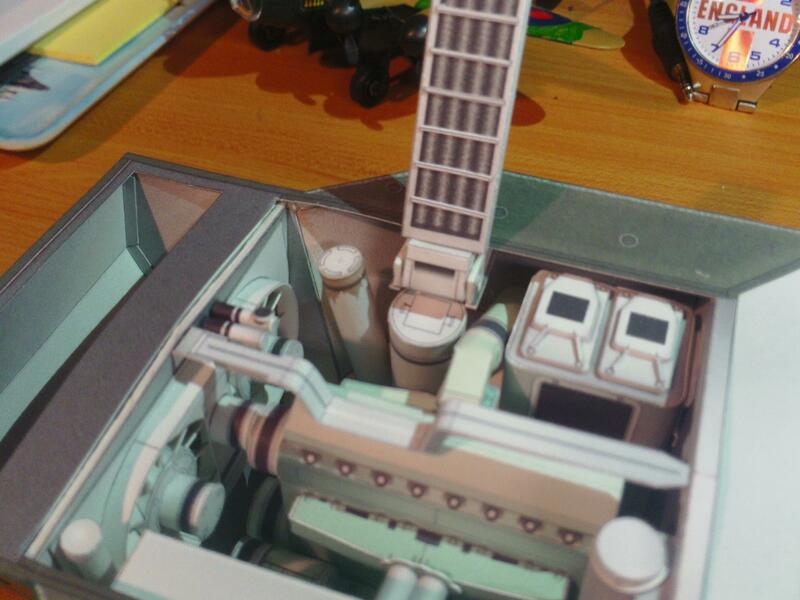 Model is 1/16 Scale, built entirely from 65lb (176gsm) Cardstock. Some internal Formers are laminated to 1mm using plain cardboards. Small Wooden dowels (wrapped in paper) are often used (for added strength) for things like Hinge Pins and axles. Everything is designed (from my mind's eye) on the computer and then printed from an Inkjet printer. I work primarily in CorelDraw. There is no painting requireded, all the colour and textures are preprinted on the parts. You just cut out the paper parts, score, fold, shape and glue the indiviudal parts and then assemble into larger structures. I use an assortment of Tools, and I mostly use Aileens Tacky (Craft) Glue. 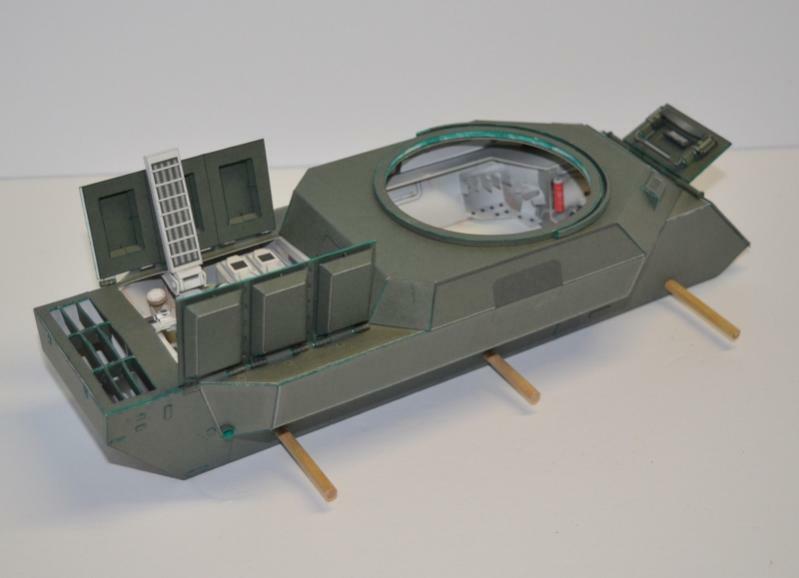 The model you see is the prototype design for a retail kit. Its about 310mm (12.5") long...the Gun Barrel should add a bit more to that. although I reach a point where I just modify what I have got (rather than start over). The build may not be exactly the same as the final release model, but its going to be very close. 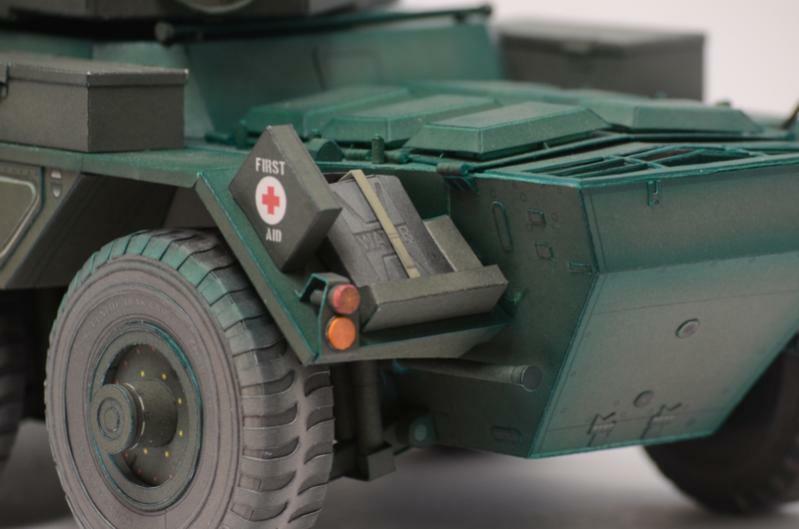 FYI...The final kit is sold as a downloadable PDF file. as well as many "Parts" pages. 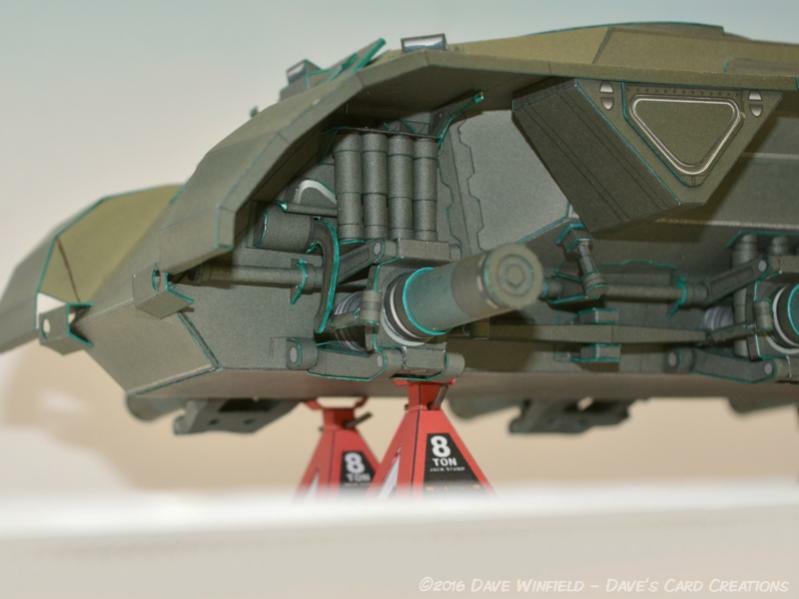 You can print the kit yourself, or take the file to a Print shop. ....just in case you make a mistake or wish to rebuild something entirely. That is disturbingly good. I would be happy to get one, if I could buy a complete set of pre-printed sheets and the required dowels, etc. I don't know that I could be bothered getting it printed myself and finding all of the extras. Those Axle Stands...lol...the focus of everyone's attention it seems! Months back I took some photos of the Chassis before the suspension and other parts went on. So I wanted to raise it up off the deck for a better photograph. 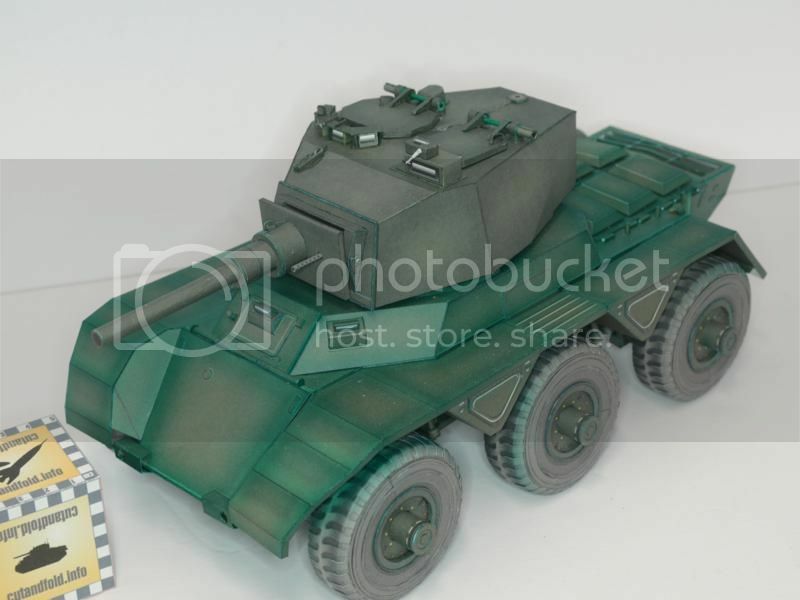 I sell some Paper Model Kits full of "Diorama Accessories". 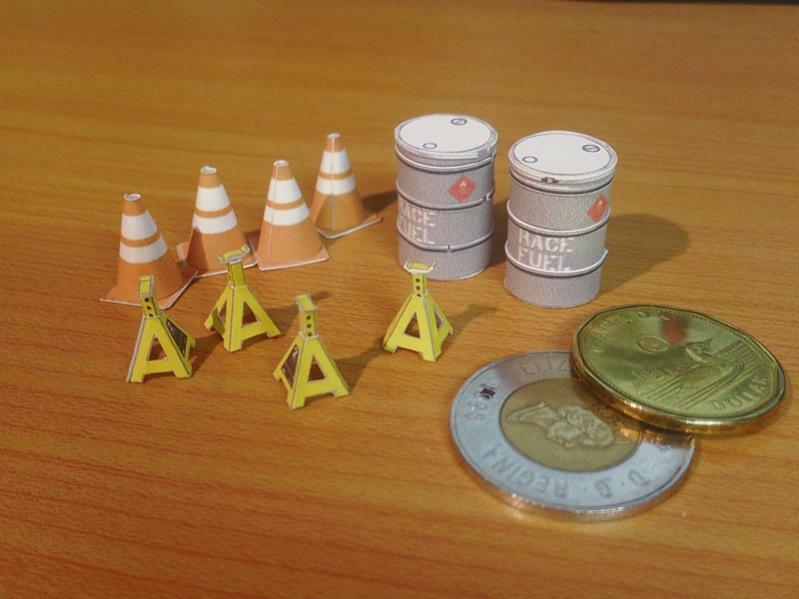 I have one kit for Automotive Diorama that includes these small scale Jackstands. And...I just upscaled the Stands, and changed the specs on the Stands (8 Ton). Although, built at their original scale, they are a bit more challenging to build. Anyway, those Stands have been more interesting to all than the Saladin itself! The Saladin continues its growth. 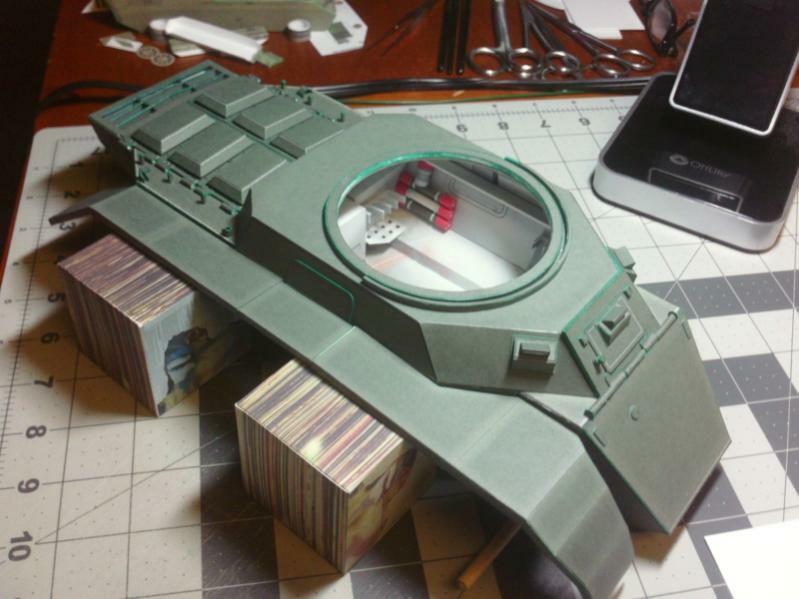 Got the Turret finished and on to surface details. Hatches and Periscopes in place. This should be all the finishing touches. Only bigger thing left are the side Storage Bins. As I said, working my way down. Can anyone tell me what this thing is? Basically just need a name to put next to the Assembly Diagram (in the model kit's Instruction pages). 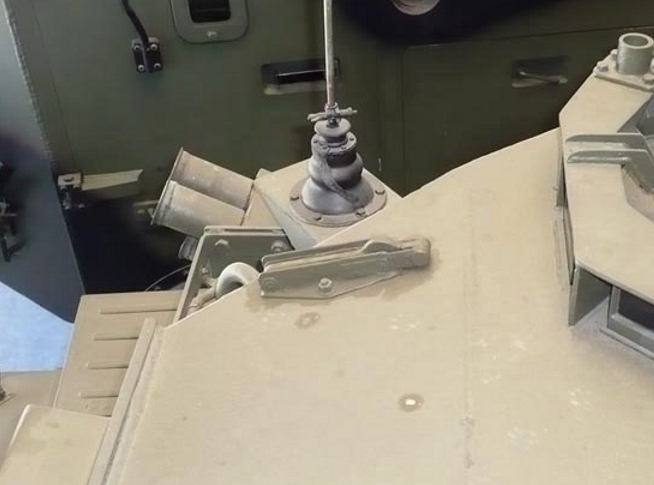 As I saw something sand-coloured .... it's a simple blade vane sight for target acquisition, used by the commander to align the main gun in azimuth only. It's a folding sight for the commander, but it does have a specific name, which I can't remember right now. 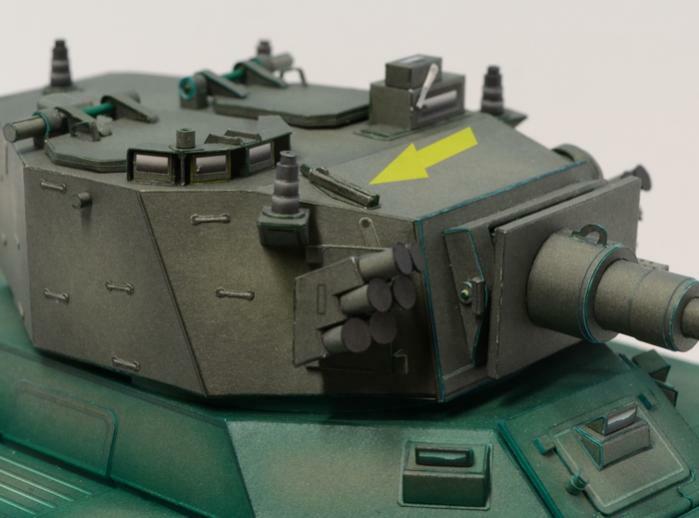 Blade Vane Sight also on Centurion and other older vehicles. Actually works; used one on many occasions in my SDaladin days. 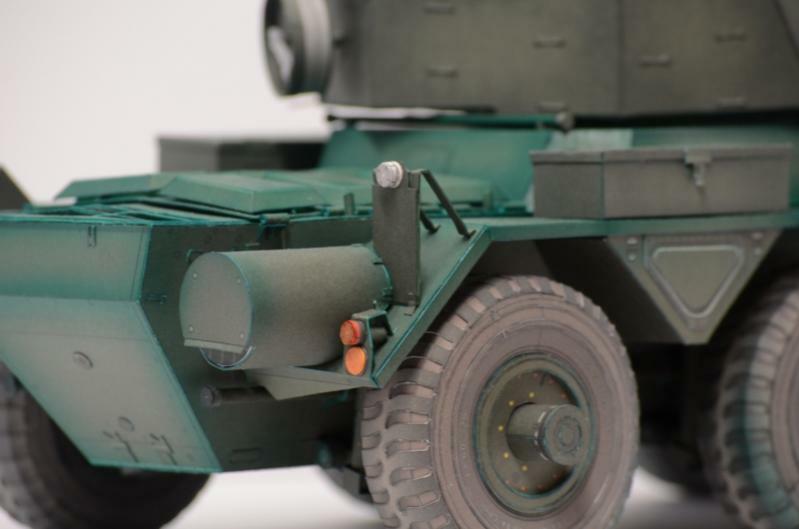 It folds up so the Commander can see it through one of the forward periscopes. Getting down to the finish now. Just adding some final surface details to the Saladin. 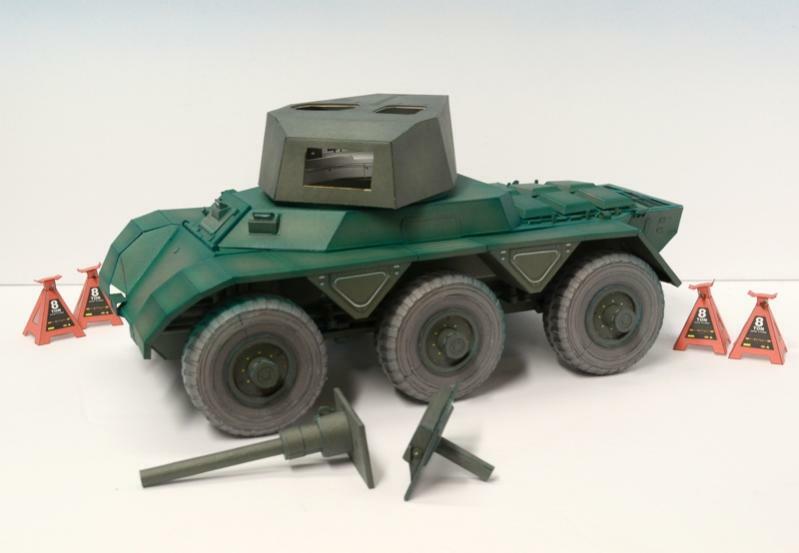 but I've decided to include some "surface decals"
and I like this photo/vehicle (shown below). 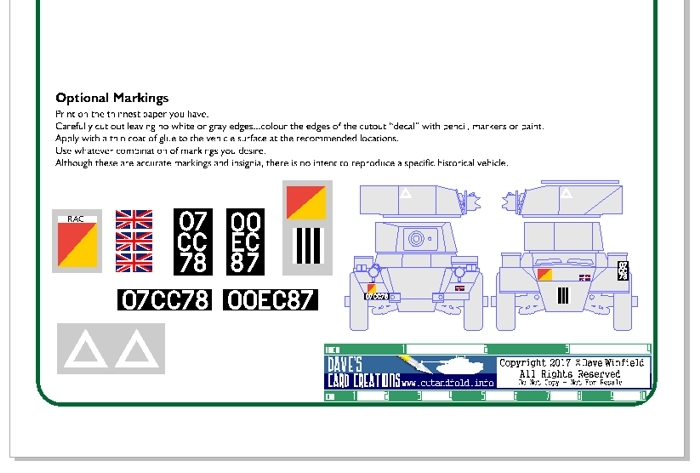 I'll use this road registration (OOEC87), but i am unsure of the decals/crests that you can see. Can anyone identify them?...give the the crests info, or what I need to track down the artwork? I've seen the Sword and Crown crest before, but I've forgotten where. And the third decal almost looks like a Figure? Flower shaped insignia (on the Turret of the previous Saladin) must be the same as this one. Can anyone identify the decal itself. but I can't seem to find a decal or insignia matching this look and shape. London District operators of Saladins, were to the best of my limited knowledge, only ever The Household Cavalry. Blues & Royals, methinks. There were several varieties, same shape with or without squiggly bit protruding on base. Some had, in the middle, EIIR or an eagle. Guess it depended too, on year. 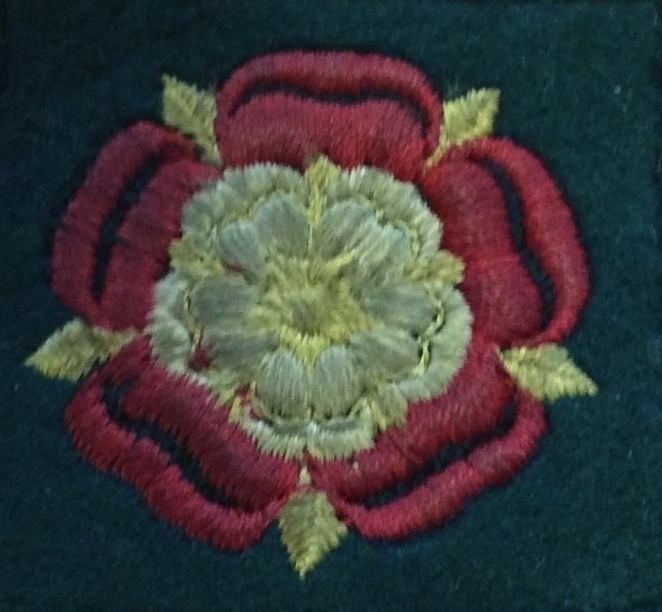 The regiment certainly served in Catterick as the RAC Training Regiment (not necessarily the whole regiment) and would have sported the Catterick District flash, a Yorkshire Rose as in my photo. Trick is to find another photo of a Catterick-based RAC Training Regiment vehicle to see and compare what it had for a command/district flash. The regiment’s name, in some way, or other term, would have been painted onto the white band on top of the RAC Arm of Service flash. 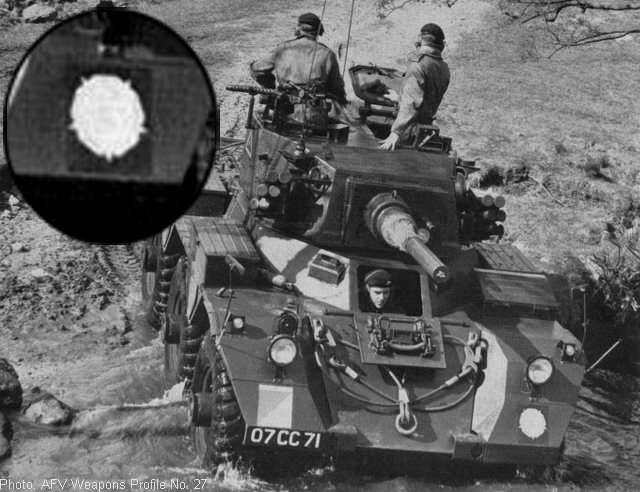 The turret may have borne the regiment’s badge, as did QDG Saladins and tanks when in the same role at Catterick. Can you see The White Horse of Hannover? I can, and it may have a garter blue background. See, it’s on the gun barrel end cap! A small garter blue rectangular with a white horse may have been worn as flash on the lower glacis, as all armour did when running around as 3rd King’s Own Hussars (Conquerors, Centurions and Dingos - DBG). Check whether or not your Saladin should also be sporting a New Zealand Fern Leaf! 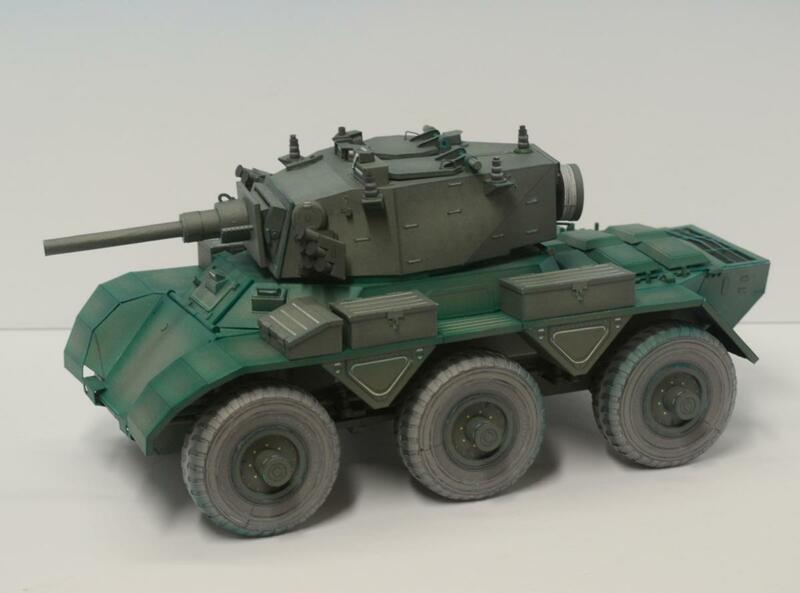 Why don’t you settle for something simpler, paint it Light Stone and represent your Saladin as a 2RTR one, Libya 1959-62. So easy! Not sure where we're going with the roses as there are so many web and book interpretations (and contradictions) of them to consider though the photo I've shown does represent Catterick District as I have photos of vehicles endorsed as being in Catterick Command and in named Catterick barracks, albeit much earlier, sporting the same or similar. The insignia is derived perhaps from the WW2 49th (West Riding) Division flash which is similar though just black and white. I have a feeling you may know lots more than I on the rose flashes Wally, so do please tell. Yes, the Berkshire & Westminsters, the bain of the Royal Tank Regiment to whom they were affiliated. I had conveniently forgotten about them, though I have it on record that 2RTR used to receive a squadron of their soldiers, minus any Saladins/Saracens/Ferrets for annual camp to undertake all sorts of field training on RTR Saladins that were handed over to them. Did the W&BDs ever have their own Saladins on unit strength? 2RTR were always glad when the W&BD returned to their 'home base' as they left behind them a tank park full of VOR 2RTR Saladins. I may have said this elsewhere on here, that I have a photo of such a wrecked Saladin on top of someone's car in a town centre. No, the parking bays were not full. wow, thanks guys, for some great input so far. 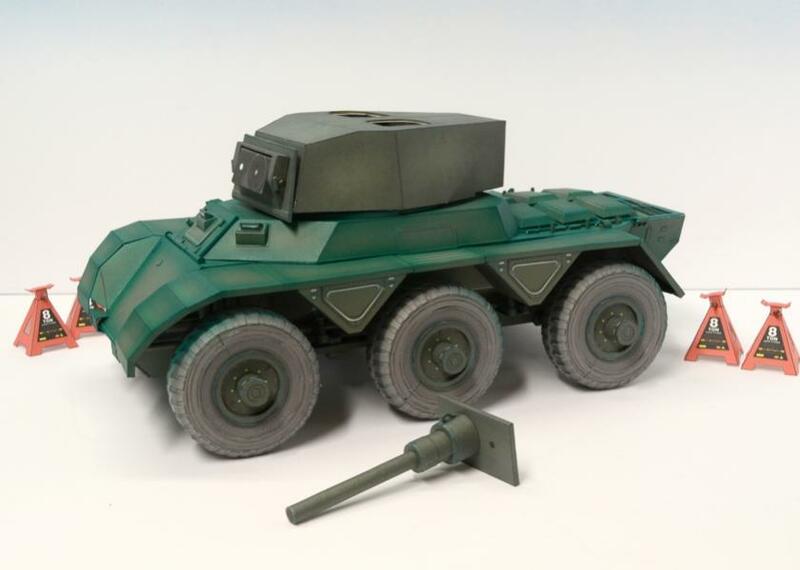 Up to now, I have designed this Saladin model in plain green, no markings or insignia. I wanted to represent an original Mark 2 Saladin in basically an early production form. Ignore the various modifications to surface details, etc over the years. The other day, I decided to add Number Plates to the kit. So I had to pick something real or make something up. I knew this was supposed to be a British Army Saladin, but not necessarily a real one. I already had referred to that first photo showing what I now believe to be a Parade* vehicle. So, that seemed like a good option at the time. 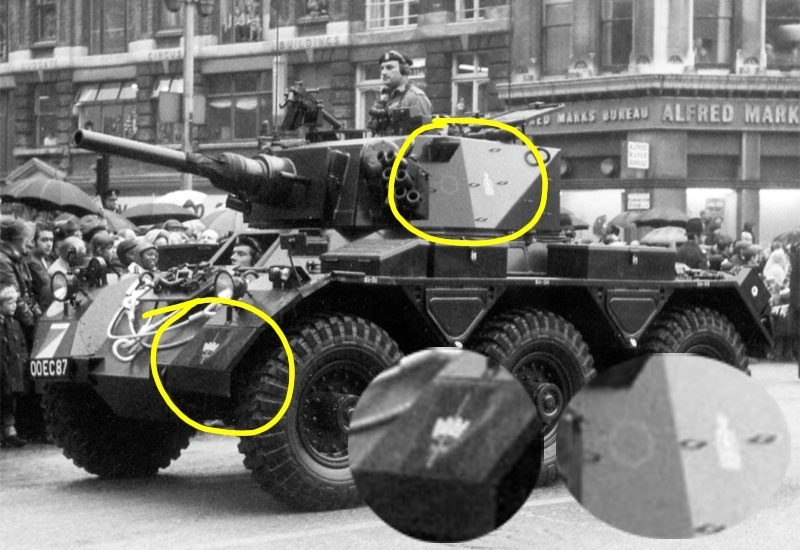 *Maybe that explains what appears to be multiple Insignia on the vehicle? The London Dist. on the front fender, a Tudor Rose on the turret, and a third Insignia behind that. With my copy of AFV Weapons 27 staring me in the face, I started looking at the second vehicle I posted (the one with the Rose Insignia). That magazine has a number of photos of what appears to be a Media Day at an Army Training ground (back in the late 50s or early 60s). There are four vehicles, 2 Saladins and 2 Ferrets, performing maneouvers. And the captions state that these are vehicles of "The Queen's Own Hussars" (A Squadron)". I can see more of the vehicles, so this seems like a better choice to copy a vehicle's markings and registration. Thats why the request for the Tudor Rose insignia. But I would need to see that insignia in more clarity to reproduce the artwork for the model. ...I have scoured the web looking for a better photo of this Insignia (on any vehicle), but no luck. And if I am trying to be accurate, I don't want to mock it up incorrectly. So, I have made a decision to be innacurate...not reproduce an actual vehicle. And I will include a few typical "decals" in the kit, that a builder can use in any combination (with a recommendation of where to place them). But I will make no designs on any specific vehicle representation. I am thinking I still might like to include a Regiment insignia or two, as appeared on a Saladin. I notice that many photos show a badge on the lower left front fender. But I need to see a clear photo of that decal to make up a reasonable and respectiful copy. For now, I've gone ahead and placed the typical front decals on my model...and included a Union Jack on the left fender. This didn't seem like an out of place decal, and would appeal to many modellers. So, I've included a couple of those, for front and rear. I agree...it would appear to be some form of white Yorkshire Rose on a blue background (in that Flash). But exactly what does it look like? Without seeing the actual decal, I can't be sure of the artwork, the colours, the overall design. And I am a stickler for reproducing things on my models as they were in real life. Or as closely as I can create them. I know its a small and possibly insignificant thing to most, but someone out there will appreciate the effort. ...especially in artist's renditions like profile artworks. Theres always too much guesswork. I swear never to use Profile artworks of aircraft and such, since they are often very innaccurate. I know many of these artists, who get their info from living Veteran Pilots. But talking to eyewitnesses is never reliable, especially when you're dealing with 90 year old veterans with 70 year old memories. I also hate it when designers use modern Fonts instead of recreating lettering as they were originally handpainted. Is it that hard to do it right? When I put out an Aircraft kit, I go to painstaking lengths to make sure it has the correct period insignia and positioning of that insignia. American aircraft are notoriously confusing throughout WW2. Period photographs usually make the difference. I always try to seek out photographs of the actual vehicle to verify the facts. So called "experts" are often just heresay repeaters. I want to see the real thing! And, if I am going to try to recreate artwork for an Insignia or the like, I like to do my best to recreate it as accurately as possible. if I can't do that, I will often drop the idea, and choose a replacement option. and as long as I can find a good photo or artwork of the original to work from. I don't just want to grab any Yorkshire Rose image and use that. Its funny how there are so few clear photographs showing that left front fender and an Insignia flash attachment? Best one I have found so far is photos of the Bovington Museum Saladin. Its the only one I have found clear enough to make out the insignia. I just didn't like it, and didn't want to represent that particular car. This Saladin is from C Squadron (Kent & County of London Yeomanry "Sharpshooters"), Royal Yeomanry, based at Mitcham Road, Croydon. I recognise their crest on the turret. We used to do the repair work on all their vehicles. or what any of them actually looked like (re that photo). Although, the front fender flash is probably understood at this point. 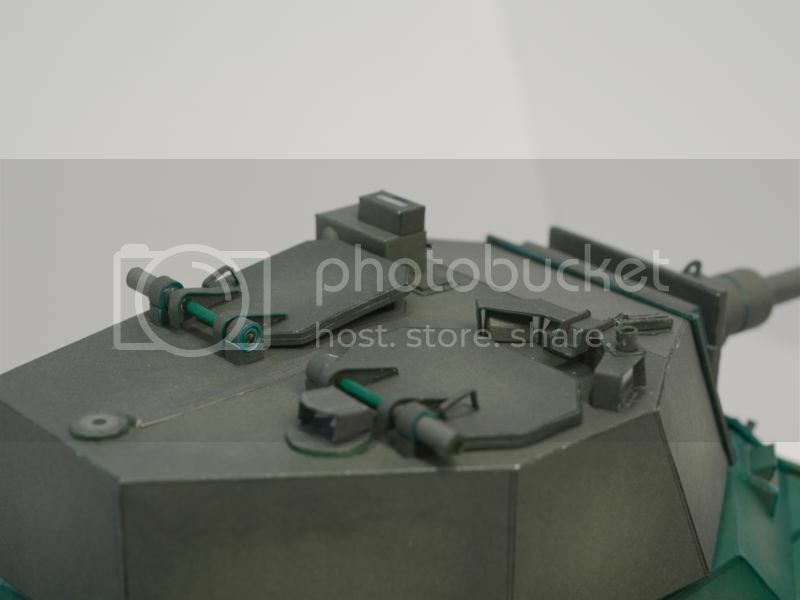 So I assume we are talking about the one on the right (of the two on the turret)? Since the one on the left looks like it is another Rose. but I don't see anything that matches. And modern/current insignia is of no help anyway. where I can see the insignia flash and can then make my own artist's rendition of it. The one on the left is not a rose but a simple circle!!! To denote C Sqn. Usually yellow on a DBG/Camo vehicle. Sometimes white. Always black on a Light Stone vehicle. A Sqn is a triangle. B Sqn is a square. C Sqn a circle. HQ Sqn is a diamond. I have around 90 colour/b&w photos of Saladins, all Light Stone liveried. Of them, around 24 different VRNs. All 2RTR Libya. The majority of them went on to serve there with 14/20H and finally, 5th Skins. There is, it seems, another Saladin model manufacturer that provides Tripolitania District Barbary Dhow flashes and the RAC arm of service that has written in the white bar, 4 R Tanks. 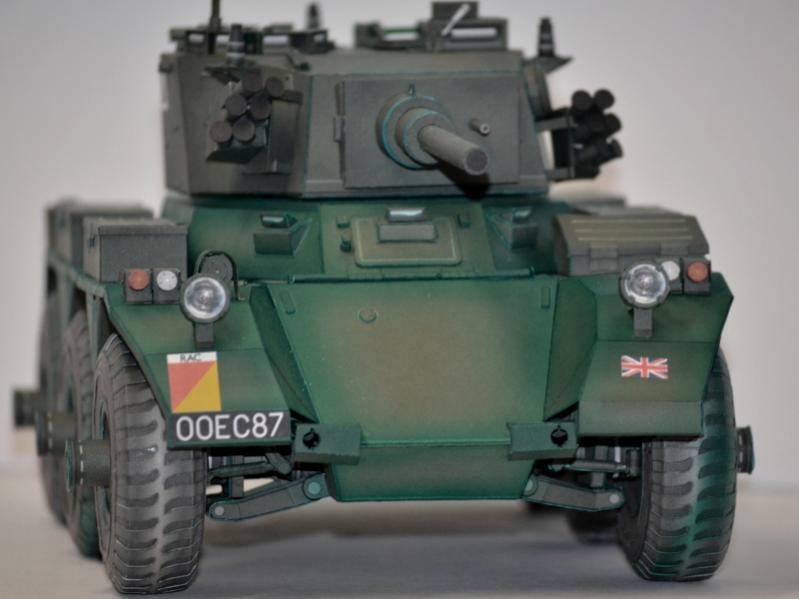 The model maker is based in Scotland, 4 RTR were a Scottish regiment and a regiment that never served in Libya post-war and never had Saladins there either. Draw your own conclusions! Yes, your research into the Saladin and in building it has obviously been meticulous, well done. It looks just like the real thing. 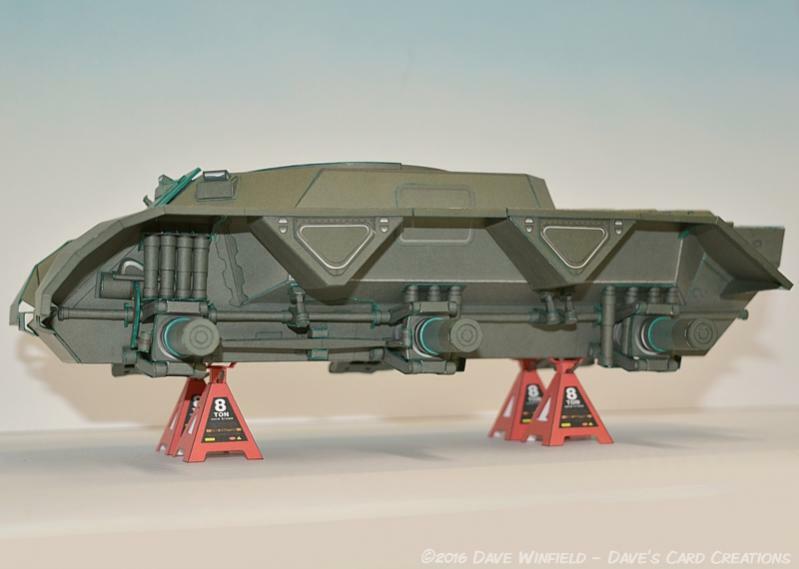 Now please do not not spoil it all by creating a fictional unit that operated the vehicle or make it harder than needs be by limiting yourself to a DBG thing based on a couple of fuzzy shots in a dated publication. 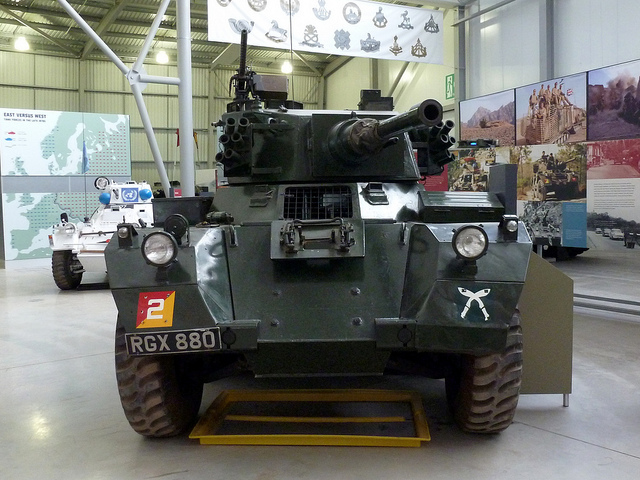 Museum examples/exhibits are not always presented as they actually were; the worst offender I'm aware of is sadly, The Tank Museum, especially where it comes to representation of those magnificent Centurion tanks. I never bother with any other museums or collections for reference purposes, preferring to obtain original photos from those who 'were there', those 'who served' and balance what I see with the sometimes foggy memories offered. Regimental journals of the period are of great help. I think a trip for you to the archives of the NAM (when open) would produce results. Just imagine how upset a purchaser of your magnificent kit would be to discover that it didn't include pukka markings! Maybe a little more research, difficult as it may prove, is needed before you commit on the choice of markings? I was already aware of the a/b/c squadron markings. Not sure why I didn't see that. Why would I create a fictional Unit? I already showed what markings I will include in the kit. The basic stuff thats in every Saladin photo. and the markings I am providing will satisfy most modellers, I'm sure. Also keeping in mind, that there are many things a modeller can add or omit on their own. Thats usually what happens with modellers. This is partly why I suggested including one or two real Regimental flashes. It would be a bonus for the modeller...if they wanted to use them. But only if I can verify their existence and actual use on a Saladin. And I need to see them to reproduce them properly. I don't know what the NAM is. I dont know what Pukka markings are. I will follow the same method as when I produced and released my Centurion kit. ...unfortunately Canadians didn't use them, so unlike the Centurion, a Canuck version will not be first release. 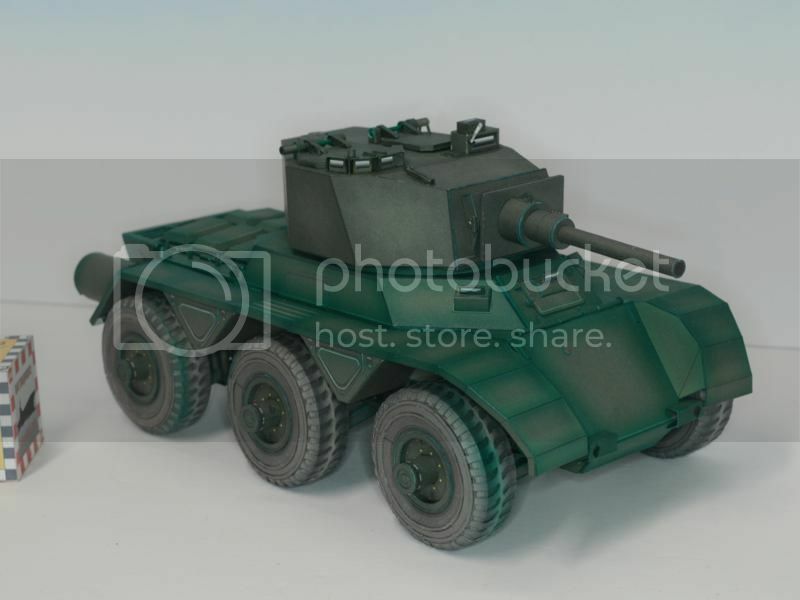 First up, will be a standard British (Green) version). Then, I had planned a sand coloured one. (I haven't done any research yet, but I already have a few photos). I have a lot of fans of Israeli stuff...I did an IAF centurion...not sure if the israeli's used the Saladin. Haven't done the research yet. After that, I had hoped to do a camouflaged version. Probably another British one? or maybe UN?